On October 26th Snug as a Bug, a rhyming bedtime story by Amy E. Imbody, hit the number 10 spot in the Children's and Teen section of the Amazon Kindle store. Snug as a Bug has been around for over a decade. It won the International Reading Association's "Children's Choice Award" in 2002. It has appeared in full picture book format, two "I Can Read" formats, including the bilingual Snug as a Bug/Arropadito y a gusto "I Can Read/ Yo se leer" format plus of course, Kindle format where it achieved top ten success. Amy joins us today to talk about her book's electronic success--which she nearly missed! 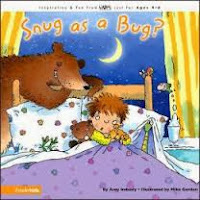 Snug as a Bug is about the hilarious "time-for-bed" conversation between a sensible child and his whimsical mom. To her list of whacky suggestions (beginning with "Would you like to sleep like a snug little snail curled up in the garden pail?") his patient answer is: "Dear Mother, I know this seems wild. But really, I just want to sleep like a child!" Oh, I nearly missed the boat altogether on e-publishing! When the contract came for inclusion of the e-publishing of Snug, I thought, "Right. Who in the world is going to be interested in an easy reader on an iPad?!" So you see, I was clueless. I'm just glad that I managed to sign and return the contract! As you might guess from my previous answer, the whole shebang has been wholly unexpected! When Snug hit the top ten in Kindle sales for Children/YA, I didn't even know it until you contacted me. That morning, I said to my husband: Guess what Snug did while I wasn't looking? Ha! Snug as a Bug was originally a print hardcover full blown picture book, released in 2001. This is by far my own favorite version of the book, for its language as well as its visual aesthetic. It is a gorgeous book, maximizing illustrator Mike Gordon's hilarious two-page spreads - and was honored to receive the International Reading Association's "Children's Choice Award" the following year. Then Zonderkidz re-released it in the "I Can Read" format you see in the e-book. Its next resurrection was as a bilingual (English/Spanish) "I Can Read/Yo se' leer!" version which I'd love to see in e-book format as so many more children would be able to access and enjoy it. Finally, I am experimenting with self-publishing for Kindle of K-3 lesson plans for teachers and home schooling parents - This little book is jam-packed full of academic content to explore as part of a thematic unit. For example, at Lorien Wood School in Vienna, VA, where I am Head of School, Snug is part of a thematic unit for K and 1st graders on the topic of "Sleep, Rest, and Sabbath in God's World." Children use the book as a starting point to learn all about what happens while we are sleeping, about animals that hibernate, about habitats, about various kinds of "sabbath." OH, I certainly hope not! There is nothing like holding a "real" book, turning its "real" pages, feeling its heft in your hands. But e-publishing has made some kinds of access much more possible for some children, and their little brothers and sisters cannot tear the pages! As a parent (and now I am a grandparent!) I would happily supply to my children - a hundred times! - a beloved print book that is accidentally "injured" by too much love, before I would consider replacing it altogether with only an e-print version. That's my own old-fashioned bias speaking! Find more fascinating authors at the latest Kids' EBook Bestseller List, updated every Saturday with the top tens from the top stores.